Cat owners often know instinctively when their pets are unwell and it’s this sixth sense which often enables action to be taken at the earliest stage. Just like humans, cats and kittens can be struck down with a huge range of illnesses, both physical and mental. Sometimes the tell-tale signs are obvious but there are other occasions when it’s much harder to detect when your cat is ill.
Cats are extremely defensive and protective by nature and are capable of hiding illnesses very well indeed. To their detriment this means an illness or disease is sometimes not detected until it is well advanced. 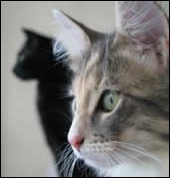 There are many common indicators of illness in cats and kittens and just some of those to look out for are anorexia, bad breath, bleeding, bloating, blood in urine, conjunctivitis, constipation, coughing, diarrhea, drinking excessively, excessive licking, fever, gas, head shaking, itching, jaundice, limping, nasal discharge, nasal congestion, redness of skin, face or eyes, seizure, sneezing, straining, swelling, vomiting, weight loss and worms. Some problems should really set alarm bells ringing and require an immediate trip to your veterinarian's clinic - these include jaundice, inability to stand, vomiting blood, difficulty breathing, seizures, inability to urinate and uncontrolled bleeding. If any of these problems develop at night you should visit an establishment which provides after-hours emergency veterinary care. Most veterinary clinics have an answering machine service which will provide you with guidance on how to to get help at an emergency clinic. Of course it's best to have this information already to hand before an emergency arises. Help and advice on many illnesses and ailments affecting cats and kittens can be found on this site - however this is provided for information only and you should always seek prompt, professional assistance when your pet become ill.
You should never administer medication to your cat or kitten without consulting your vet first. And never make the mistake of assuming that a remedy recommended previously for a particular problem will be appropriate if a similar problem arises. Many medical conditions may resemble one another, but their treatments can in fact be very different. It could prove emotionally costly to you if you make the mistake of trying to guess the correct treatment for your cat.